An unexpected frozen sprinkler pipe rupture at work got me a free afternoon off today (the brighter side of mixing water and electricity, but I digress). I took advantage of the time to buy winter tires and even got them installed. 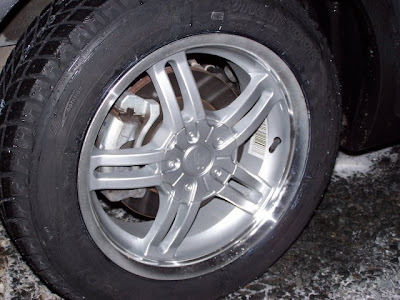 Cheap black steel rims seem to be running in the 60-70 dollar range, and Canadian Tire in Clayton Park just happened to have in stock, 4 Sacchi "winter alloys" (perhaps they saw me coming) at $99 a piece. 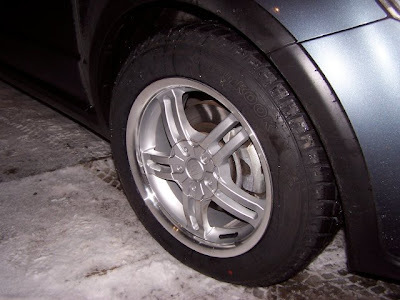 I bought their "cheapest" 205-60R-16 winter tire; a Hankook I*Pike RC01. They are listed as "starting at" $41.99, but that must be the wheelbarrow size, since mine were $94.99 each. Anyway, long story longer, Debbie's new ride is now ready to tackle the winter season...the wheels look similar to the stock alloys, and are likely worth the convenience of not having to pay for repeated tire changing etc.